It seems the Px48 from Sroda will get another extension of its boiler certificate from June to November. 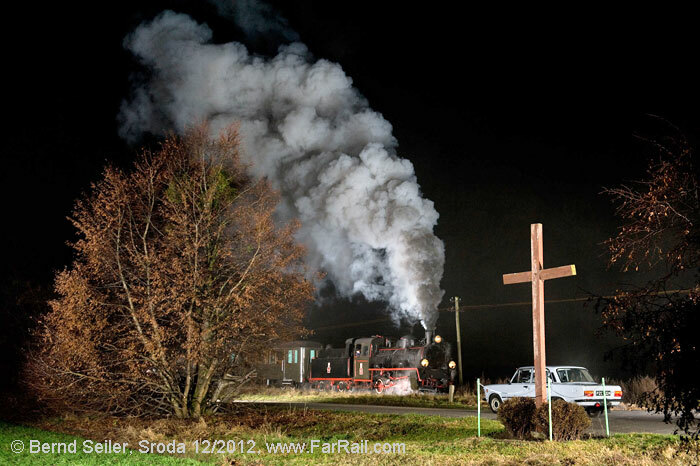 This will give us the chance to repeat our night-session tour on this narrow gauge line. The future of the locomotive is as dark as a late October night: it would need a complete overhaul to get new certificates. But no-one can tell you who will pay for it. Another extension of the boiler certificate is very unlikely. They’ve already had to stretch some rules to get the extension for another six months. The decision will be made in June  then we are able to confirm the tour. We’ve “celebrated” virtually all possible photo opportunities on this line in various seasons. And we did night shots in early December last year. This is what we want to repeat. We’re planning classic night shots as well as flash light shots. We’re planning two shots of a moving train with flash lights. The group meets in Sroda in the afternoon. 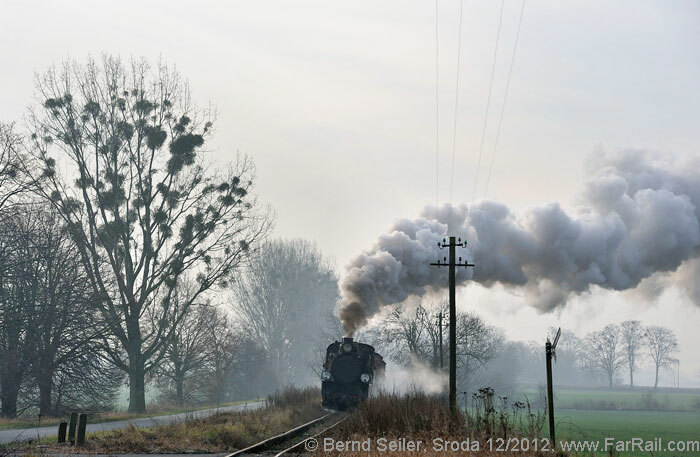 Around 14.30 hrs we’ll leave Sroda with an authentic looking passenger train tender first to Zaniemysl. With three extras, much artificial light and our steam train we’ll take pictures at the terminus, at one intermediate station and on the line. In the evening we’ll take pictures in the station and in the depot. Hotel in Sroda, some 90 seconds walk from the depot. 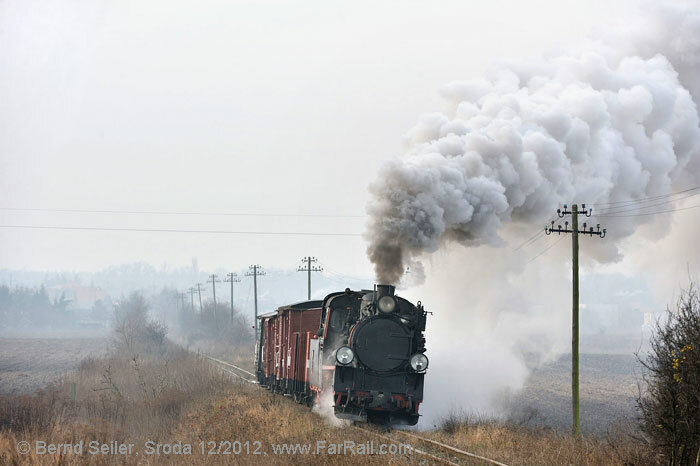 With an authentic looking freight train we’ll go to Zaniemysl and back. We’ll reach Sroda Miasto around 11.30 hrs. 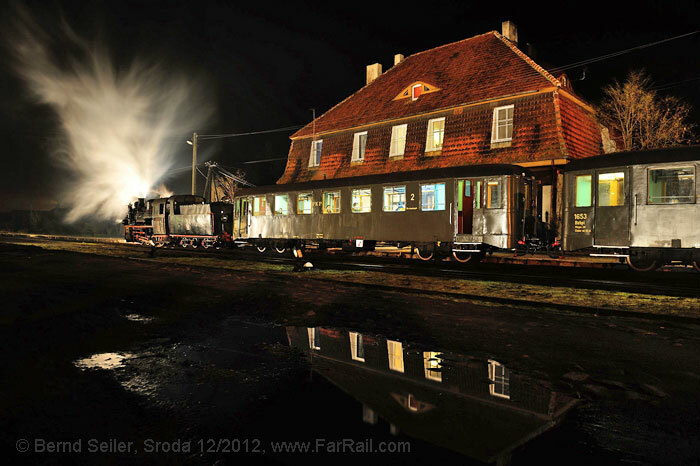 The railway men will take care of the locomotive in the depot and will drop the fire. Individual journey home. The originally meter gauge “Schrodaer Kreisbahn“ had an extension of almost 100 km (without their standard gauge line system, which was operated by the company as well and sold some 80 years ago to the city of Poznan). 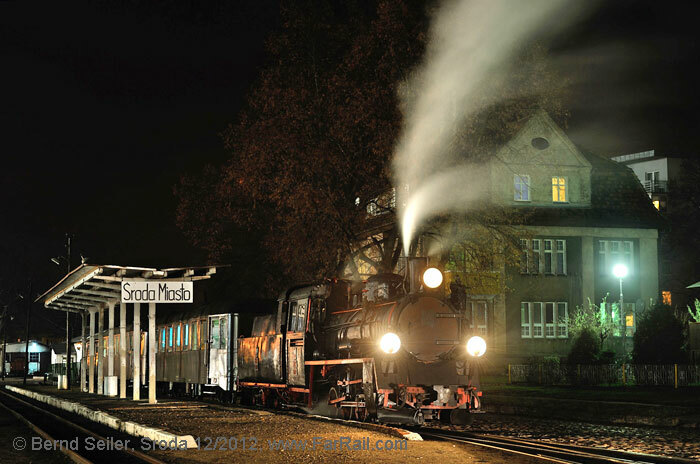 The only surviving narrow gauge part is Sroda  Zaniemysl (Santomischel). On this 14 km long section we’ll run two trains, one in the morning and one in the darkness. The morning train will be a narrow gauge freight train, comprising some different wagons including the obligatory guards van, where we’ll put some emergency seats. 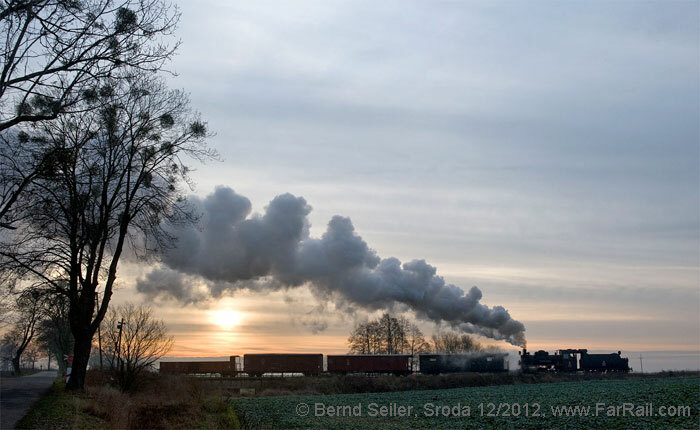 In the afternoon/evening we’ll have a passenger train with two coaches plus guards van. This was the arrangement in the last days under PKP operation up to 2000. As a point of interest, this was the last genuine steam operation of the Polish State Railway PKP, if you consider Wolsztyn as a museum project with regular trains (which it was already at that time). We’ll replace the current inscription on the passenger coaches with the old PKP lettering to make the train perfect in detail. 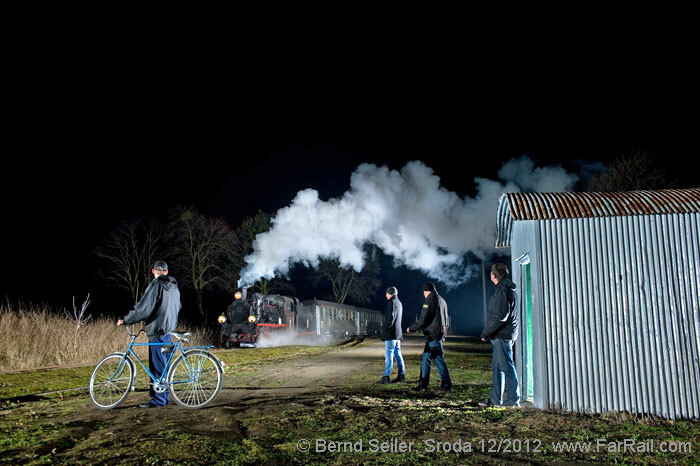 Unlike the other lines, Sroda still has some freight cars which were examined last year. The line is almost unchanged since the last PKP trains ran on it. Countryside highlights are not available here, so we’ll use the moody twilight and dark hours to illuminate the train with our own light and the early morning light. Morning light of course only if there is any  late October can be very grey, wet and with dim light. But October can also come with frost, moody morning mist, colourful trees and low sun. The tour starts and ends at the narrow gauge station. The state railway station is about 900 yards from our hotel and the narrow gauge station is right around the corner from the hotel. You neither need a car or taxi to get there unless you want to carry a 60 kg heavy bag for the weekend tour. 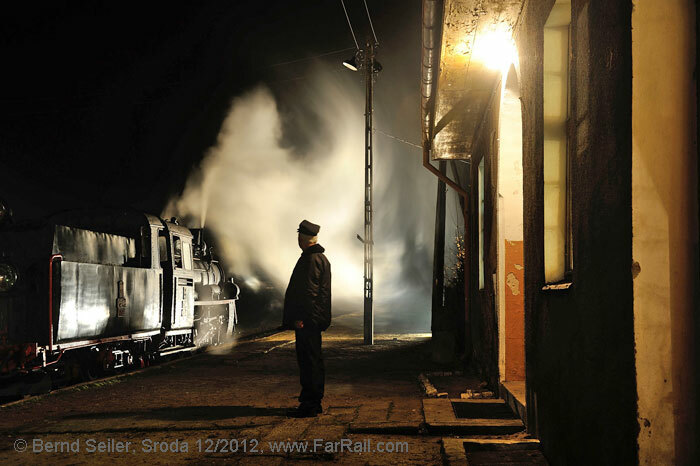 The tour is designed for the demanding and dedicated photographer and video film maker as well as for the lover of authentic narrow gauge steam trains. In addition it is good for all who want to travel back in time, as there was no rush travelling from A to B (or in our case from S to Z). There won’t be poisonous energy saving lamps in the coaches, but warm light producing good old Wolfram light bulbs. The tour requires something which might be difficult for dedicated photographers: to be able to step back. If you need to stand always in the first row and will never move you’d not be happy with the style of this tour. For video film makers we’ll let the train pass one time without releasing flash lights. Flash light shots are time consuming. Due to the limited water reserves of our locomotive we can’t spend the whole night repeating a flash light shot ten times. It’s not possible that every participant can connect his personal camera to the cords and sensors. Instead we’ll take a flash light shot (probably) with one Canon and one Nikon full frame camera in RAW mode and will give a digital copy to every photographer on the tour before the tour is finished. These pictures can be used and published under your own name. On top of this we’ll allow the dinosaurs among us photographers  i.e. those using traditional film to connect their camera to the flash equipment once. If we have more than two traditionalists we can’t do it for everyone of course. In this case the paragraph above about stepping back is the rule. As mentioned the flash light shots are time consuming. You should have a certain level of patience, even if we have minus three degrees Centigrade and some snow is falling. This would be, by the way, optimal conditions. However, if it is rainy the flash equipment often fails. We can’t guarantee that everything will work as we wish. The scenes we’ll illuminate with flood lights should work under any weather conditions  only electricity is required. Those pictures can be easily captured by everyone. It might be that we’ll arrange mixed light pictures as well as pictures only with the local illumination. We know how to take an interesting night shot, how to illuminate it and how to expose it. We don’t care if someone wishes to place a light ten inches in front of the locomotive  we’ll not do that. To make sure everyone will take home close to perfect night shots please let us build up the equipment according to our plans. The pictures shown here are from our tour in 2012. We’re planning two pictures with flash lights and three to four pictures with traditional or “natural” lamps. For the video film makers we’ll keep the flash lights off once for the line shots. Please be considerate to others when taking pictures since all participants want to bring home high quality shots. To make this tour successful for you, you should bring a tripod. If you have questions about night pictures do not hesitate to ask before you book the tour. You should be prepared for mild as well as wintry or wet weather. Don’t wear your best clothes as they may catch some dirt from the steam train. High visibility clothes are not recommended either. Poland is a member of the European Union. Following a deep recession, the economy is now growing strongly, even during the recent worldwide recession. However, the state of repair of many buildings does not match that in Canada, UK or Germany, for example, and the condition of the roads leaves something to be desired. Traffic may follow different rules from those you are used to. The official language is Polish and the younger population often has a decent command of English. Many citizens also speak some German. Petty crime such as theft or pickpocketing is no worse than in other European country. Nevertheless, you would be well advised to keep a close eye on your photo equipment, as always. Our hotels can be considered as very secure. Electricity (220V, 50 Hz) is available in our hotel, power cuts are very uncommon. You may need an adapter for the sockets (they have a special safety pin in the centre of the socket). Mobile phone coverage is very good, Poland uses the normal European standard. Please take care as you will have to pay roaming costs for incoming phone calls as well as outgoing. The narrow gauge line has only one serviceable steam locomotive. 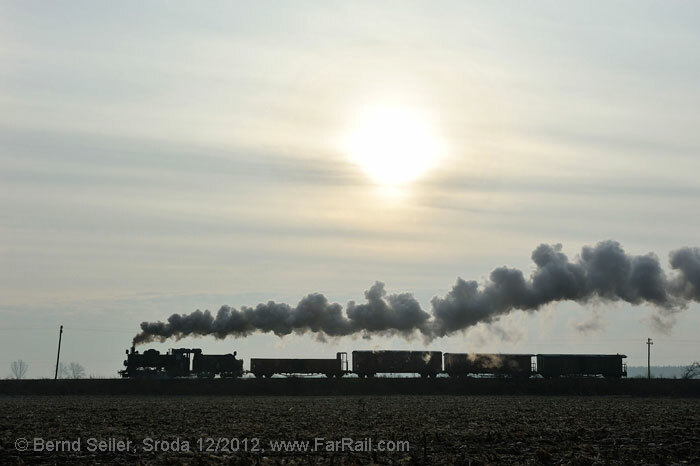 As there is no spare, technical problems may put us in a situation where we can’t offer the proposed steam trains. In addition you need to consider that the condition of the railway track is, sometimes, very poor. Derailments may occur. In the worst case the local authorities may close the line for technical reasons such as weak bridges or dangerous track conditions. Hence we can’t guarantee that we’ll be able to run the proposed charter trains. We’ll use wagons which may not have been moved much for some time in some cases except on our previous charter train events. We might have to sort out problems which prevent an early start as planned or the use of a certain type of wagon. Please be prepared that not everything will run as ordered. Boiler certificate extended - tour is on.